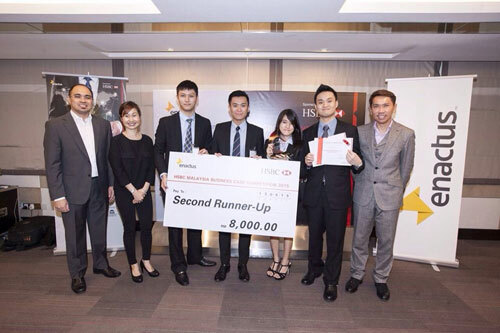 The competition, which kicked off with a two-day training workshop in Cyberjaya saw the participation of 16 highly competitive institutions, and ran over a course of two weeks starting with the Preliminary competition in Istana Hotel Kuala Lumpur on 29 April 2015, the Semi-finals on 6 May 2015 and Finals on 7 May 2015, both in Best Western Hotel, Petaling Jaya. INTI was represented by four dynamic University of Hertfordshire undergratudates, namely: Nicole Chew Ye Tung and Loh Khai Ren, Bachelor of Finance; and Lee Kok Meng and Justin Yong Quo Li, Bachelor of Marketing. INTI successfully completed both the preliminary and semi-final stages of the competition and moved into the final leg to compete with Nottingham University, Monash University and Sunway University. INTI’s team emerged as the Second Runner-Up in the competition, securing the prize of RM 8,000.00 and greater share of confidence from presenting their findings to the judges as well as top corporate heads. The popularity of programmes such as the HSBC Case Study is evidence of the crucial skills employers are now looking for even among students in higher education. Through its focus on developing students’ abilities to collaborate, critically assess challenges, create suitable solutions and clearly communicate their ideas, INTI is providing young people the edge not only for their success in competitions, but also in their future careers.